16GB Flash cannot cost $30 more than the 8GB Flash. All these listed products, the versions differ only across “quantity” dimension. We can infer that different segments of Apple customers differ in their preference for storage capacity and value it differently. Price has nothing to do with cost. Take a look at the pricing of versions of iPod Touch and iPad. The 32GB Touch is priced just $70 more than 8GB Touch but the 32GB iPad is priced $100 more than the 16GB iPad. I am not a hardware engineer but I am willing to bet that the components used for storage are the same. 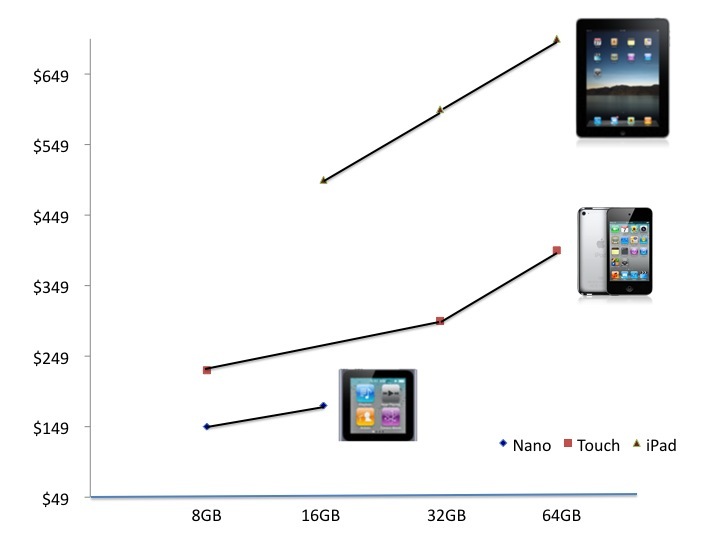 The 32 GB iPad is priced higher because the perceived incremental value to the customer by moving from 16GB iPad is more than that for a customer moving from 8GB to 32GB Touch. They probably will increase the pricing of next iPad (the one with FaceTime and Retina Display) to $529. See my previous article on iMac versions pricing. On the same note, Kindle 3G is priced just $50 more than Kindle Wifi, but iPad 3G is priced $130 more than iPad Wifi. Again, the radio parts are most likely the same. iPad is charging more because the perceived and real value to the customer from being able to consume multi-media from anywhere is much more than the value from the ability to buy books from anywhere. This despite the fact that iPad 3G customers pay a monthly data access fee and the Kindle 3G customers do not. Apple excels at practicing price discrimination and pricing products based on value even if the versioning dimension is tied to the same meter. That is admirable, compared to what we saw earlier this week with XBox Live Pricing. Note1: See BusinessWeek’s take on Apple pricing. It addresses only the behavioral aspects of pricing. There is a bigger pricing strategy story here which I will cover at a later time. Note2: The only takeaway should be, “Practice Value Based Pricing”. We should not get distracted by how it is done with the core principle.